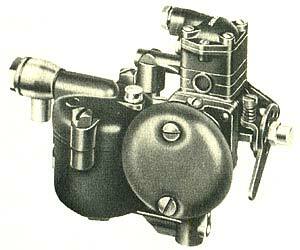 The Solex Thermostarter F Type carburettor. Homepage. This page: A 1930s' leaflet describing a Solex carburetter specifically designed with winter motoring in mind. Motoring in the pre-war years could be a tough business, with most cars having just 6 volts to churn the engine over with on sub-zero winter's mornings, compounded by the fact that most cars had to live outside in all weathers. Lighter engine oil compared to that used in summer might help, but if a new product were to come along, guaranteeing an easier time of things when starting a car from cold, no doubt 1930s' motorist would take a keen interest. It was to these potential buyers that Solex pitched their new Thermostarter carburettor to. 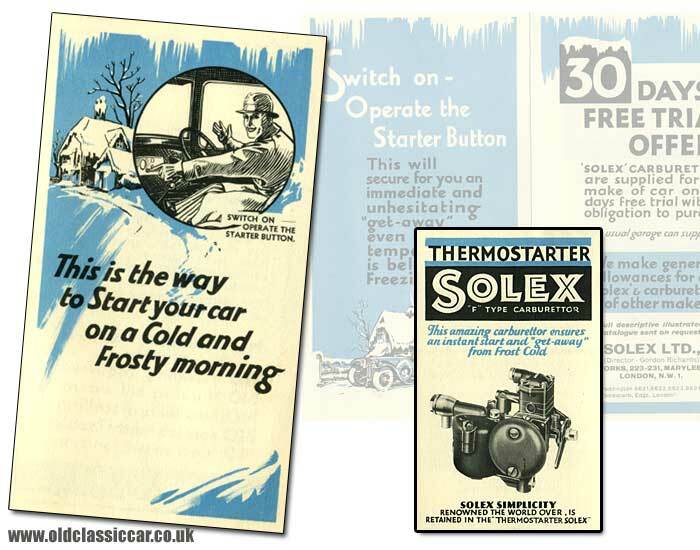 Before opening the leaflet, the reader is shown a smiling motorist, dressed in full winter's clothing, cheerily operating his car's starter button, confident in the fact that it'd fire up without issue. "This is the way to Start your car on a Cold and Frosty morning" was the advice. The fact that no dashboard control was required, refers to how an automatic choke arrangement offered the pre-war motorist an enticing list of benefits..
A booklet explaining how the Thermostarter works in detail, published by Solex in the 1920s/1930s, can be found in the OCC Reference Library, on this page. "Re the new Solex fitted to my Austin Seven, the ease of starting is a revelation to me and petrol consumption nearly 54 miles per gallon." "With reference to the new Solex fitted to my Hillman Wizard. It starts from dead cold at the first touch of the electric starter. Winter ceases to have any terrors. Your Easy-Starting Carburettor is so simple and so practicable. I am making some petrol consumption tests and can say already that there is a distinct saving in fuel." "The new Solex on my 12 h.p. Austin is most satisfactory; the starting from cold far better than any carburettor of my experience. There is no spitting back afterwards; one can drive the car away directly after starting. Plenty of power - more miles per gallon." "I have tried out your new Solex .... it is an amazing device, and I think you are too modest in your published claims for it. My starting troubles have entirely disappeared, and is still amazes me that my engine, which was previously definitely sluggish, should start so easily, and drive away without any signs of spitting or any other sluggish movement." 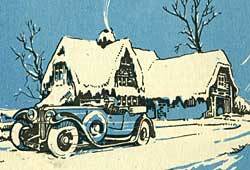 A hardy pre-war motorist driving his Solex-equipped open tourer during the winter months. If the reader still needed convincing of this product's merits, then Solex could also offer a free trial - "Solex carburettors are supplied for any make of car on 30 days free trial without obligation to purchase - Your usual garage can supply you". And if that wasn't enough to get you hot-footing it down to your nearest motor garage, the company would also ".. make generous allowances for old Solex & carburettors of other makes". What more could 30s' motorist want? Further details could be obtained from the Solex Works in London, either in writing, by telephone, or by telegram (Solexcarb, Edge, London). Were these carbs really such a boon in the winter months, and was it that reliable? I'd be interested to hear from anyone who used, or uses, a Thermostarter on their pre-war car.